Skin cancer is serious business and yet we take an incredibly haphazard approach to sun protection. Even when we think we're covered, we're not, but who can tell? Most of the sunblock we use is invisible anyway. Sunscreenr, the sunblock detection gadget from Voxelight, aims to make the invisible visible and to save us from missing spots and potentially life-threatening skin damage, or at least a nasty sunburn. Suncreenr can't prevent that sun damage on its own. Instead, it's the digital companion to your sunblock-applying regimen. The tiny, hand-held device looks like an over-sized key chain (and ostensibly could be attached to your keys). Once you've applied sunscreen to yourself or someone else, you can look through the device's view finder to see how completely you applied the sunscreen. 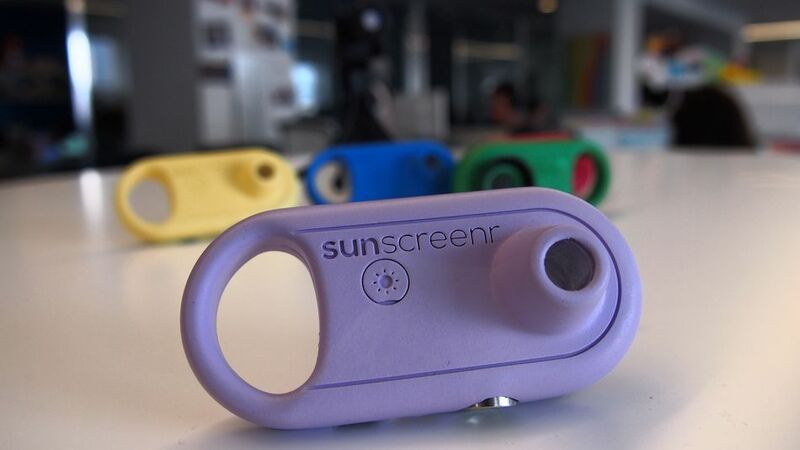 Inside Sunscreener is a 1.3 mp UV camera that looks for reflected UV rays. If the sunblock is doing its job, it absorbs the rays. As a result, any place where you did apply the sunblock will look, through the viewfinder, black — because it's not reflecting UV light — and the uncovered spots will look pale. If you are alone, you can record up to 30 seconds of video in the device and then watch back inside Sunscreenr to see if you missed covering any spots. Voxelight representatives tell me that this method will work on darker skin complexions as well, though the contrast will be somewhat diminished. At least this is how it will work when the product is done. When Voxelight CEO David S. Cohen visited my office this week, he placed a half-dozen smart-looking Sunscreenr's on my desk (each one was a different color). However, the working prototype was a small black camera on a tripod. 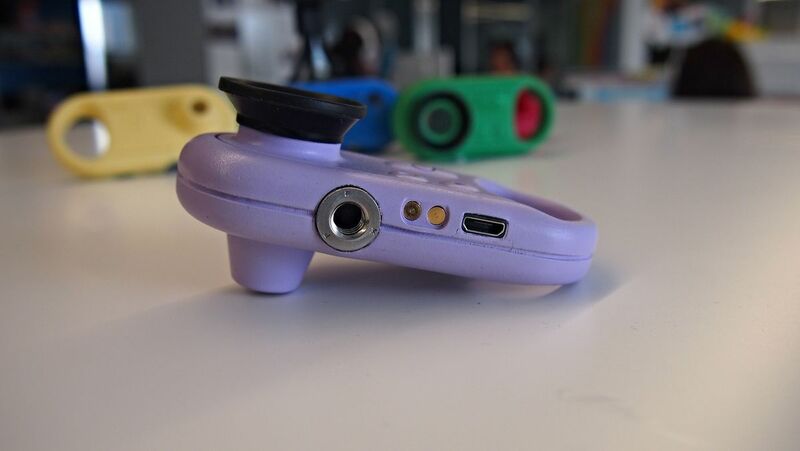 Sunscreenr, which launched on Kickstarter early this year, is still in development and productization phase and is currently on Indiegogo. The company hopes to launch later this year. "We considered building it as a smartphone attachment," Cohen said, but they realized that the phone screen isn't the best for bright sunlight situations like the beach and that it could be damaged by sand and water. They decided instead to build something rugged, easy to view (you put your eye right up to the viewfinder) and sand-proof. Cohen let me try out the prototype. Since there's virtually no UV light in my office, save whatever leaks from the fluorescent lights above (they're UV lights encased in glass tubes coated with a phosphor that reacts to the UV light), Cohen brought in a UV light source. He cautioned me not to stare directly at it. I rubbed some sunblock on my face and, sure enough, I could see in black and white what was covered and what was not. When the final product is done, it will allow for up to four hours of continuous use, though Cohen believes most people will only need to use it for one hour per beach visit. For now, each video collected in Sunscreenr will disappear as soon as you record another. Cohen said they may consider social sharing for a future version. 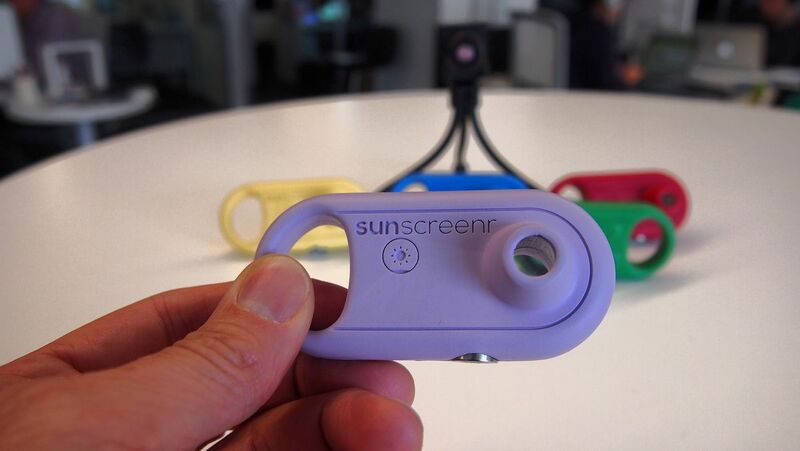 Voxelight could build the final Sunscreenr, but they are also considering a partnership. "We were contacted by five different sunscreen companies within the first week of the Kickstarter campaign," Cohen said. 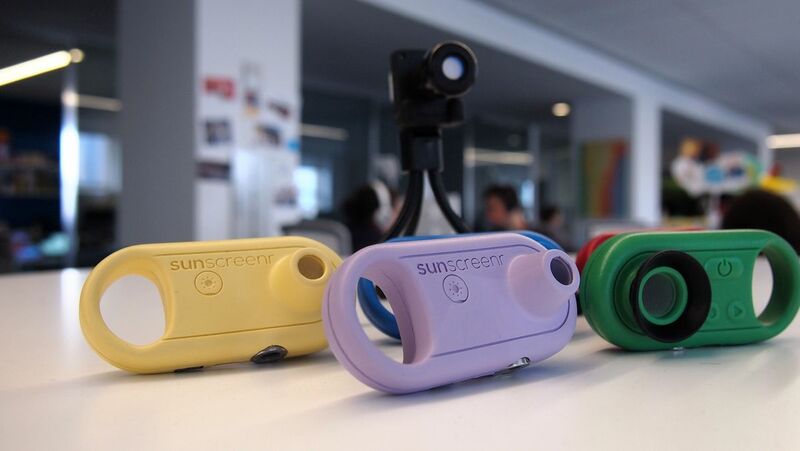 Right now, people can pre-order Sunscreenr for $109, but Cohen thinks success could change that price. "In quantity, this thing could have a retail price of $20," he said. As I pondered my sunblock covered face in the video-readout Cohen had jury-rigged to his computer, I imagined never again discovering a bright red patch where I'd failed to spray or painful red ears that I again forgot to cover in sunblock. "Once you can see something that was previously blind, you don’t want to go back," Cohen said.